Save over buying these pieces individually! 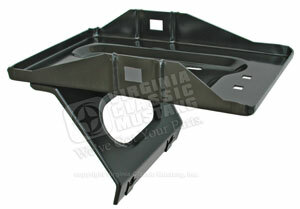 This battery tray is designed to accept our EG267 67-70 Style Top Holddown Clamp and our EG270 Holddown J Bolts. This is a much safer alternative than the stock side holddown clamps. Most of today's batteries do not have a side lip to accept the stock 65-66 side holddown clamp. This tray allows you to safely secure your battery the way it should be. Ford went to this design in 1967 for this reason. Fits the popular Group 24 battery.